A book and movie named The Perfect Storm told the story of several New England fishermen who lost their lives at sea because of the storm’s strong wind and waves. The book and movie helped make the term “Perfect Storm” famous. This term is now used to describe forces that unite to create events that have magnitude and significance. A few years ago another kind of perfect storm took place in the Central United States. This was not a weather related storm but a combination of individual speakers from different parts of the country. These dynamic men were asked to teach on the topic of faith at the Agape Church Faith Conference in Little Rock, Arkansas. The men involved in this meeting were Jerry Savelle, Charles Capps, Dr. Frederick K.C. Price, Keith Moore and Happy Caldwell. After the Faith Conference in Little Rock, I discussed with Happy Caldwell, the Pastor of Agape Church, my desire to take the meeting tapes and develop a book from this “Perfect Faith Storm.” Pastor Caldwell heartily agreed because he knew this book would bless many people around the world. He wanted you and others to experience the same power through the pages of this book that was originally available to those who attended the meetings. The record of the life Jesus Christ, and others throughout the Bible, contains many wonderful acts of faith. Jesus Christ demonstrated faith with his words and actions, and he expected his followers to have faith. He went about demonstrating all things were possible to those who have faith in God. Miracles, signs and wonders confirmed his teaching about faith was from God. Jesus Christ often taught about faith and it was an essential part of all his teachings. The entire Bible is filled with stories about men and women who walked by faith and lived their lives by faith. Faith is mentioned more times throughout the Bible than almost any other topic. Faith in God is important for anyone who follows Jesus Christ. This book is written for you to know and understand how you can live a life of faith that pleases God. 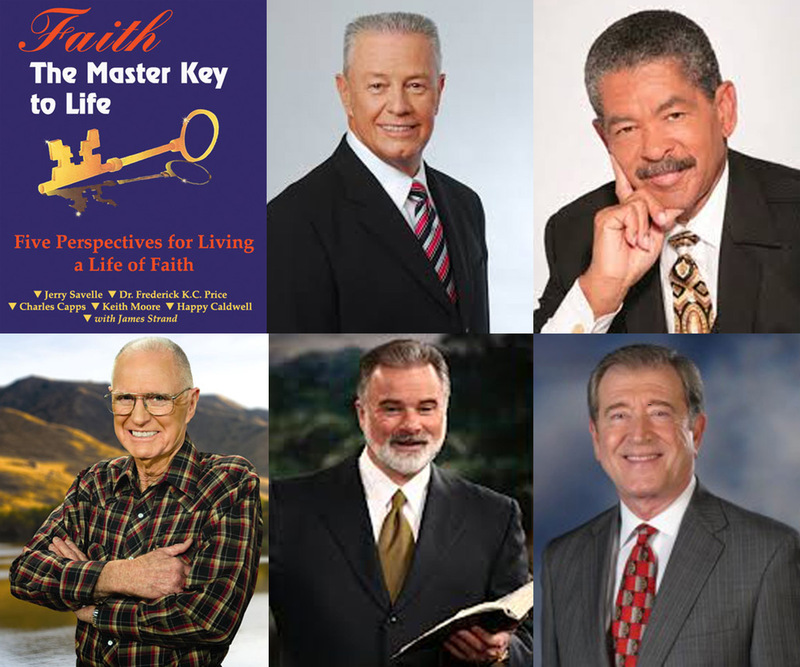 This book will show you how five different men of God have used the principles of faith to change the circumstances of their lives and the lives of others for the better. This book is presented to you with expectation that your faith will grow and increase as you read about and apply the principles of faith to your life. Your circumstances can change for the better. If you have the faith to believe what God promises is true, and if you put your faith in those promises into action, all things are possible! There is a difference between belief and faith. Dr. Frederick K. C. Price during one of his sessions explained the difference between belief and faith very humorously. He said you can go out into the parking lot of the church with the key to your car in your upstretched hand, jump up on the hood of your car and boldly proclaim to the whole world “I believe this key will start my car!” No matter how many times you proclaim this, your car will not start until you actually get in your car, put the key into the ignition switch, turn the key in the switch and start the motor. Faith is more than believing. Faith involves acting on what you believe. When you act on what you believe in God’s word, you turn on the power of God with the key of faith. Faith with corresponding actions is necessary for receiving the blessings and promises of God. A manager of a large apartment complex can open any door in the apartment complex when something needs repaired. There may be hundreds of apartments, but he only needs one key to open any one of the doors. The key he carries around that allows him to do this is called a master key. The master key denotes authority over the entire apartment complex. A regular key denotes authority over one particular door. Keys are symbols of authority in general, but a master key has the authority to open many doors. Faith is the spiritual master key to life because it can unlock all the precious promises given to you by God. There are five main parts in this book, one part for each of the speakers at the Agape Church Faith Conference. At the beginning of each part is a brief description of the speaker and his ministry. Then, his message on the topic of faith follows. At the end of each part is contact information for obtaining additional ministry materials and resources from the speaker. Part 1” Includes two messages from Jerry Savelle. The first message, God is Who He says He Is, is a short, dynamic, inspiring proclamation about who God says he is. This message reminds you of the old-style evangelistic messages delivered by evangelist like Oral Roberts years ago. The second encouraging message from Jerry Savelle is called God Wants You to Increase. God spoke to Jerry Savelle and told him to preach and teach about increase wherever he went around the world. This message includes his personal testimony of increase in his life. It includes some excellent teaching on six ways to position yourself for increase in your life and ministry. Jerry Savelle backs up his message with many examples from the Bible of how God’s way is a way increase and blessing. Part 2 is Dr. Frederick K. C. Price’s message, The Importance of Faith. This is a classic message from this great man of God. Apostle Price summarizes the basic aspects of faith in a concise way that is unique to him. He uses his many years of experience teaching and discipling others to connect to his audience and readers. This is a masterful message on the basic Bible truths concerning faith in God and it practical applications. Apostle Price’s insights on the difference between faith and belief, his understanding of faith and love, and his knowledge of the laws of faith makes this a life changing message. Part 3 is Charles Capp’s message, Faith Filled Words. This message comes straight from the heart with humor and practical applications of the principles of the law of faith. Charles Capps simplifies the word of God with illustrations from his life and his years of insight in teaching about faith to millions around the world. Watching what you say and understanding the effect of negative words is something every Christian should read and apply to their life. He talks about the biblical truth you can have what you say with the perspective only available to a man who has walked with God for many years. Part 4 is Keith Moore’s message, Turning Little Faith into Big Faith. Keith Moore combines practical teaching and years of experience helping people receive the things that God has promised them in the Bible. He gives and answers the question asked by many, “Can your faith increase?” Keith Moore gives biblical illustrations of how your faith in God can grow stronger and increase. Increased faith brings increased blessing to you and others. He also shows you how to keep your eyes on Jesus Christ and not give the devil any place in your life. Keith Moore shows you how you can turn your little faith into big faith to overcome your weaknesses. Part 5 is Happy Caldwell’s, message Victorious Faith. This message encourages you and builds you up in your faith and overcome the obstacles to your faith. The heart of a Pastor who has spent a lifetime ministering and serving people all over the world comes out in this message. He talks about the purpose of tests and trials and shows you how you can have joy in any situation in your life. Happy Caldwell weaves humor and practical day to day suggestions in with his teaching on faith. He shows you how you can experience victory over the world through faith in God. The Epilogue includes a look at Hebrews Chapter 11, also known as “The Faith Hall of Fame.” It uses the many examples in this chapter to encourage you to have great faith and become a future member of the Faith Hall of Fame. Finally, in the Appendix you will find First Steps to Faith and The ABCs of How to be Saved. If you are reading this right now and you are not sure if you have faith in Jesus Christ or not, you should go to the end of the book and read these first. If you already have faith in Jesus Christ, you can use these as examples of how to present the Good News to those who do not have faith in Jesus Christ. As a standalone booklet or tract, First Steps to Faith and The ABCs of How to be Saved, can be given to others during an evangelistic outreach, or you can give them to anyone you may come in contact with during your day-to-day activities. These materials make great gifts to anyone you want to hear the Good News of faith Jesus Christ. They can be obtained separately from Word Catcher Press. 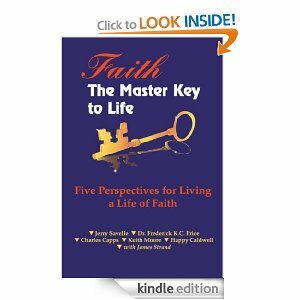 Faith the Master Key to Life: Five Perspectives for Living a Life of Faith by Jerry Savelle, Dr. Frederick K.C. Price, Charles Capps, Keith Moore, Happy Caldwell. Edited by James Strand is now available for Kindle eBook readers. Kindle eBook readers are available for all PCs, Macs and smart phones. You can purchase this Kindle eBook at Amazon.com. Click on the image to go to the Amazon eBook Store for a free preview look inside or to purchase.